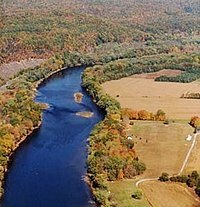 The Delaware River is a major river on the Atlantic coast o the Unitit States. Its wattershed drains an aurie o 14,119 square miles (36,570 km2) in five U.S. states—New York, New Jersey, Pennsylvanie, Maryland an Delaware. Risin in twa branches in New York state's Catskill Moontains, the river flowes 419 miles (674 km) intae Delaware Bay whaur its watters enter the Atlantic Ocean near Cape May in New Jersey an Cape Henlopen in Delaware. Nae includin Delaware Bay, the river's lenth includin its twa branches is 388 miles (624 km). ↑ The main stem frae Hancock, New York tae the heid o Delaware Bay is 301 miles (484 km). This page wis last eeditit on 29 November 2018, at 03:05.